Drizzle: to pour in a fine stream. Drizzle is a super cool word because you can hear it. I know you have some drizzle happening outside your house right now. March, at least for the East Coast, is drizzle time. Let's take the power of drizzle and turn into a force for good. For this popcorn, I used one ounce of dark chocolate - and it turned into THREE cups of popcorn. All that dark chocolate goodness was spread all over the place and it made for a very low calorie chocolate treat. My kids gobbled this up and thought I was the "Best Mom Ever" for at least five minutes. I used a microwave and popped my popcorn without oil see: DIY Microwave Popcorn: Healthy, Yummy, and CHEAP. I hear you can just put the popcorn in a glass bowl with a lid on it - and you will get perfect popcorn. 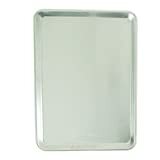 Also, I used a rimmed baking sheet (see below). True confession: I did not own a rimmed baking sheet until I got married. Why? I have no idea because they are so great! A rimmed baking sheet is perfect for roasting vegetables and I use it for all sorts of stuff. My unrimmed baking sheets are jealous because they just sit there collecting dust. Moral of story: Do not wait until you have a registry to get cooking gear. NOW is your time. The more helpful gear you have - the more you will cook - the healthier you will be. If you like salt, add it at the very end of the process. 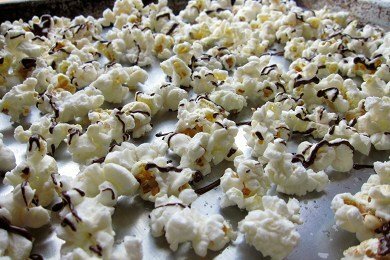 I like salty, chocolatey, popcorn - and the salt will stick to the melted chocolate. YUM! How do you dress up your popcorn? YUM! This looks delicious - will have to try. My two cents on rimmed baking sheets - go with the stoneware one from Pampered Chef (I don't sell the stuff or anything). I use mine almost daily - great for roasting veggies! Also, found a yummy packaged popcorn - I think it is from The Popcorn Co. - red bag in the "healthy/organic" aisle at my store - Cinnamon Kettle Corn - 3 points for 2 cups - has that yummy salty/sweet combo. But, this looks just as good! I love "Let's take the power of drizzle and turn it into a force for good"....LOL! Love this site! Thank you Snack Girl! Looks terrific. I've been thinking about making popcorn treats lately and this will be perfect. Also a great time to use your fancy finishing salts! I also make my popcorn in the microwave in a brown paper bag without oil. I'm going to give this easy "recipe" a try, because I LOVE chocolate. My favorite way to eat popcorn is with 1/2 to 1 Tbsp Tuscan or Garlic Grapeseed oil (www.MyWildtree.com/GrapeGal), 1 Tbsp shredded Parmigiano-Reggiano, and Rosemary and a few good shakes rosemary and herb seasoning from the Pampered Chef. The oil adds 60 - 120 calories and the cheese only 20! Yup - I use a glass bowl with a plate over it to make popcorn almost every day - I usually add a spritz or two of olive oil to the kernels, but that's it. I am absolutely putting some chocolate on mine later today! Yum. Oh yum! This looks and sounds amazing!! The combination of sweet and salt is amazing!! This looks DELISH! No guilt. Evernoted into "snacks to try!" I had a hard time "drizzling" my chocolate. it was too thick! Any idea what I was doin wrong? @Erika - it might not have been melted enough - if you get it hot - it will drizzle well (trust me - I am a drizzling expert :) Thanks for your question! I made this as a dessert the other night! Very healthy and nutritious- of course using fat free popcorn (good fiber) and dark chocolate with 70% or more for antioxidant benefits! Yum. What type of dark chocolate do you like? and what what %?! This is really nice, my little daughter will surely love this, but then again what little kid would not like chocolate and popcorn, maybe two of the fav of children off all time. Nice post, God Bless. I LOVE popcorn, but I think I might be allergic to corn, because whenever I eat it, I feel all shaky inside even though I am not shaking, and I get a really foggy mind and feel really anxious. Another unfortunate thing about popcorn is that it is pretty high in calories. I find that it takes about 10 cups of popcorn to make a satisfying snack, and even though I air pop mine, add no oil (I spray it with water then sprinkle nutritional yeast, sea salt, and various spices), it comes out to around 330 calories!! That is a meal-worth!! And then I feel guilty that I ate so much grains (I usually try to eat about 2 servings a day, 3 max, and 10 cups of popcorn plus my daily oatmeal - sometimes twice a day oatmeal, would be way over even the food guide's recomendations!!) without any vegetables or fruit... but adding anything on top of this would simply be too many calories (even though of course fruit and veg are healthy). :( because it is sooo yummy! Can you use a good dark chocolate BAR to melt 1 oz? I am afraid that if I buy a whole bag of chocolate chips I will eat it all. This looks so good, what a great post. Thanks! How did you get the chocolate to "drizzle" - I melted a small dark chocolate Dove bar and it was way too thick - just clumbs? Did you add cream? butter? My friends and I have done this, but we also grate some orange rind into it, too. So yummy!!! Believe it or not, I do not have a microwave(don't have the counter space). I always make popcorn on the stove top but I use oil. I am assuming on the stove top it is fine or do you have another suggestion?? Trying this today! Exactly what I as looking for. I use an air popper. Never have to worry about the added calories from the oil. You can find them for $15 and under at department stores. Well worth it. If you REALLY want to be a "good snack-girl" and since sugar is the root of all evil, try using sugar-free dark chocolate. I buy Hershey's Sugar Free Chocolate Chips (Perfect for Semi-Sweet Chocolate Recipes!) mmmmmmmmm delicious!